Crystals are known to have a variety of healing powers. Today’s focus is on the powerful semi – precious gemstone Labradorite which is said to possess powerful metaphysical properties. People who perform metaphysical work can be exposed to negative energy. 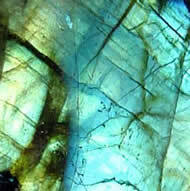 According to Hall 2011, Labradorite creates an interface that facilitates metaphysical working. In addition, Labradorite enables one to monitor what is going on in another energy field without taking on conditions from the field or entering it. The semi-precious gemstone can feature blue, green, violet , yellow, orange or red metallic tints. Overall, Labradorite is known for its transformational powers. Hall, J. (2011). 101 Power Crystals. The Ultimate Guide to Magical Crystals, Gems, and Stones for Healing and Transformation. The Five of Wands like all five’s in the tarot can indicate conflict and change. However, unlike the Five of Swords, the conflict represented in the Five of Wands is on a lighter note. The Five of Wands signifies loss or indicates some type of difficulties usually in the realm of competition. 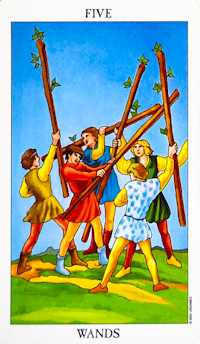 A good example of the Five of Wands would be if people are playing a sport and they are competing against each other. They are competing within the game for the sheer joy of the sport but they don’t intend to purposely hurt each other. How doe this apply to me as the card of the day. I’ve been experiencing some problems at work which are due to competition. It’s nice to know that the competition is in good spirit and that the people aren’t really out to hurt me. What does the Five of Wand mean to you?